Grow Careers - A career in horticulture, what does that look like? What does a career in horticulture actually look like? A career within horticulture can often be a daunting prospect, with such a wealth of opportunities available to you the question is where do you start? We have been asking some professionals currently working within the industry a bit about how they got to where they are and why they love it so much, and with any luck this will guide and inspire you to join them! 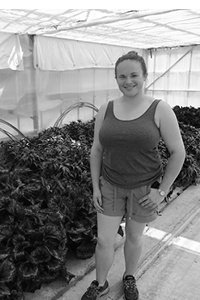 So what first interested you about working in horticulture? I completed the rotational traineeship as well as a diploma at Kew and found that this way of learning suited me well. It was quite intense at times but had a good balance of both practical and theoretical learning. We were also rotated around the garden and so were able to experience a lot of different plants, garden styles and managers. I think that that gave us a broad understanding of horticulture and now enables us to be flexible in how we work and to think around a subject. What happens on an average day as a Head Gardener? At Knightshayes we have an amazing plant collection across the whole garden and are currently undertaking a lot of renovation work in areas. The job can change dramatically from one day to the next as can the plants we’re working with. I try to spend as much of my time outside as possible talking through a lot of what we want to do as a team. I am really enjoying getting my head around the plants we have here, rhododendrons are a current fascination as we have an amazing collection that needs sorting. Its also great to see what a team of passionate gardeners can achieve together. We have got a lot of clearing work done over the past few months, and there is more to do, but being able to see that you have made a difference when you go home is immensely inspiring. I am getting better at being patient and understanding that we will get round to things at some point, even if it doesn’t all happen this week or even this year. There is still a part of me that wants to get everything done now and quickly but I know this would not be feasible or good for the garden. What would you say your biggest work achievement has been? I am still surprised and chuffed to bits that I am the head gardener of Knightshayes, I do feel lucky to get to come to work here everyday and work with an amazing team. We have a lot we are able to do with the garden, and hope to do over the next few years. I had a bit of a gap year after college and travelled, got some life experience, worked in a cardboard factory and did some stints at Anglia alpines with a focus on herbs. I then moved on to working with tomatoes in the new forest for a period. What happens on an average day here as general manager? There isn’t an average day in this particular position in life, the role is partly strategic looking ahead at future development, crops and investment. But too often you will deal with things coming out of left field and supporting the management team which is the biggest part of it, trying to build a team that is capable and able to do their jobs effectively. A lot of meetings and a lot of walking around giving advice. I try and get out of the office as often as I can but it’s never enough. There are days when you are attached to a computer but the walk around the site is light relief but also great to absorb what’s going on. I love just watching good products grow and get put out the door. Although I am not directly involved and hands on, everyone is technically involved in that process and seeing that happen makes me very proud. Whats the most challenging part? Its juggling those demands that come out of left field. Lots of problem solving, and that’s what makes it so interesting. What would you say your biggest work achievement has been so far? Getting to this position was something I had aspirations to try and do, the industry as we know it hasn’t got a lot of opportunities at higher management level so it was something I didn’t think I would ever quite get to do. I enjoy developing the business, building new glasshouses, but seeing people flourish is the other part as well. Seeing the businesses grow, we want to be market leading within the industry, the place people want to come and work with. I have been the general manager here for 5 years, on the nursery for 20 years from dispatch manager to operational management to here. So understanding a lot of the background has been key and its gone very quickly which I think it a testament to how enjoyable it’s been. Do you enjoy being able to work outside? I love it, my family come from a more administration based background and I am the only one that likes being outdoors. I can’t stand sitting in an office all day constantly typing! Why do you enjoy working in horticulture? I’ve always had a passion for horticulture from a young age, I’ve always enjoyed working with the plants and the environment and the people who have various skills and talents and I have always tried to learn from them. What first interested you about horticulture? The use of plants and different textures because every plant is different, I am always in my greenhouse trying to find different ways of organising the plants. I always find it interesting because there is always something new to learn. How did you get started in horticulture? After gardening with my grandparents, I went to Merrist Wood college for 3 years and got a national diploma in horticulture. With a new found understanding of almost every aspect of horticulture, that helped me get into the industry. 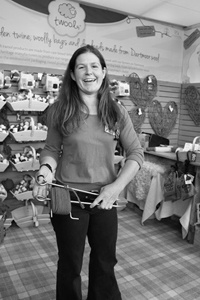 My first job was a work experience, 300 hours of working in a garden centre over Christmas. What can you tell me about an average day here, what do you get up to? It differs, because I am a team leader I am not based in just one department. 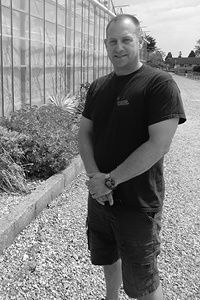 I am usually potting, despatch or propagation or general maintenance for the crop growers. I think for me it’s being able to use my skills, because I am quite young people expect me not to have the level of experience that I do. but it’s great to be able to set targets and see how you can progress, get your hands dirty and see all the different aspects of a production nursery. I think for me I’ve got Asperger’s so I have a communication problem. I try not to let it affect me and because I don’t have a lot of team leader experience it’s hard to explain to new staff members how we are doing things and changing things. What is your biggest work achievement? I think it’s being here for a year, my longest running job is here and I think that’s a great achievement, having the opportunity to work with such amazing people. What advice would you give someone that’s looking to start working in the industry? Because I had a good horticultural education I would say it’s best to get your education started first, and you can then use that education to gain experience. I would say don’t be afraid to try new things, there are loads of sectors in horticulture, if you’re not enjoying it don’t be afraid to try something else! I would love to be a manager of a department, I do love working with young plants and seeing them grow and then being sent off to the crop growers. That’s the direction I am going for, or I would love to have my own business, a small nursery maybe. Overall why would you tell someone to work in horticulture? It’s an adventure, there’s always something around the corner. Whoever is around you will always give advice on how you can adapt how you are doing your job. Just don’t be afraid to ask, people will be happy to help because we have all been in that position before. What first interested you about working in horticulture? As a passionate plantsman I get to work with plants every day. I love propagating and nurturing them to a stage where they are of benefit to people; either for their ornamental value or edible qualities. To me, there is something very special about growing your own plants. I take joy from growing species plants, appreciating the millions of years of natural selection it has taken for them to get to where they are today. What is great about the horticultural industry is the variation of professions and disciplines it encompasses. There is a fantastic range of prospects for people of all ages, abilities and interests to engage with. 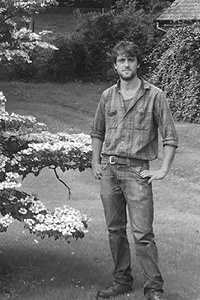 Upon abruptly leaving school and a brief period of employment in my local butcher shop, I enrolled in a horticulture course at the Barony College. Whilst not really being all that interested in the academia, I took a real shine to the different elements of practical horticulture. I took a few seasonal positions in grounds maintenance, at the local garden centre and on a Christmas tree farm. 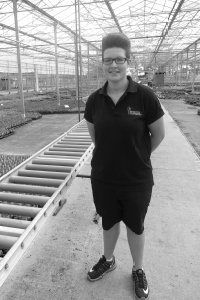 These positions, whilst brief, helped me to gain work experience in different fields within the industry and to gain appreciation for the broad range of professions held under the banner of horticulture. After this, I took the leap and began working on a self-employed basis when I took on the maintenance of some local private gardens. This was a successful enterprise but it was then when I realised how little I knew and that I needed to become more knowledgeable. I enrolled on the Horticulture with Plantsmanship course delivered by SRUC and Royal Botanic Garden Edinburgh. Having access to a world-renowned plant collection, as well as mixing with host of vastly knowledgeable and experienced people, I could improve my skills both practically and academically. My first job was as a seasonal groundsman at The Chrichton Estate, Dumfries. This is a large green space consisting of Parkland, a rock garden and sports pitches. The estate is home to many local businesses and it boasts a fine collection of mature specimen trees. What happens on an average day in your current job? Currently I manage a garden on a private estate in south west Scotland. As I have control over my own day to day activities, I do my best to keep the work varied. There are times when I have no choice but to spend days if not weeks on one task; hedge cutting for instance. I live where I work so I generally head for the greenhouse in the morning with cup of coffee and take care of the daily watering. It is then left to the weather to dictate what tasks I can undertake that day. Without doubt the best part of my job is the lifestyle that goes with it. Living in the countryside in rural surroundings is just what I’m after. I get daily visits in the garden from my children after school and nursery with them often lending a hand. I love my job simply for the fact that even if I wasn’t employed to do it; I would be practising similar activities and jobs in my own time anyway! The most challenging aspect of my job is time management. It can be very easy to become fixated on single tasks with other elements of the garden becoming neglected as a result. I have learned from a couple of years in this job that, for example, the grass doesn’t stop growing because I have spent the week weeding! My biggest work achievement has certainly been getting appointed as the main gardener where I currently work. Upon setting out on my academic studies; it was exactly the kind of job I was looking to get. Currently I am very content in my current place of work. But looking forward, I want to continue to promote horticulture to wider audience. As a young man who has gained a great deal personally and professionally from becoming involved in horticulture; I would like to contribute to encourage the next generation of Horticulturists. I think that having people involved in horticulture from a young age is essential to getting them to take it up as a profession and fill the clear skills shortage the industry has. I would like to work towards more horticultural pursuits becoming a mandatory part of school curriculums, which again I think would help to raise the profile of the industry. In years to come, I would like to become the next T.V. gardener. Following in the footsteps of the likes of Percy Thrower, Jeff Hamilton, Alan Titchmarsh or Monty Don is a personal goal and an opportunity I would relish. Crucially, assuming such a role would enable me to promote what horticulture can bring to your professional and personal life. What first interested you in horticulture? On an average day what do you do? Prepping plants, checking off orders that come in and changing machines over, driving the forklift, unloading the lorries and basically anything to do with the potting. I will negotiate with my supervisor on what to do and where to go. I think learning so much, I have been here 3 years and have been put on nearly 20 different courses so they are constantly trying to expand my knowledge and give me all the training I could possibly need to help do my job the best that I can. Some of the courses have been amazing. Within months of working here, because I loved it so much, I obtained an allotment so even when I am not at the nursery looking after plants I am at home doing the same because I love it so much, and it’s because of working here. Overall why do you enjoy working in horticulture? I love the plants, I love working with the plants seeing something grow from a seed or a bulb. I always have miniature plug plants and within a few weeks they’re out the door for dispatch. What would you say is your biggest achievement at work? I would definitely say moving up so quickly, I had only been here 6 months and was offered dispatch assistant, and in another 4 months and I was a team leader at only 21. You don’t normally see many girls around it’s usually men, that just happens to be how it is and for me I love changing the machines over getting dirty driving the forklift that’s just me it’s perfect for me, a lot more fun. Stay here definitely and do more training and courses and hopefully keep going up and make manager one day. Can’t decide which area of horticulture is right for you? Set your imagination free by designing fabulous gardens, green spaces and floral displays. Help shape the physical environment around us, which has a huge effect on our everyday moods and health. You can also express yourself in art and the media, painting pictures, taking photographs, broadcasting online, on radio and TV, and writing books and magazine articles. The UK horticulture industry is worth over £5 billion each year. Businesses that grow fruit and veg employ over 50,000 people, while ornamental plant nurseries and garden centres produce and sell millions of plants, generating thousands more jobs. And it’s not just the green fingered among us who are valued, there are plenty of opportunities for technical or mechanically-minded workers, as well as sales people and entrepreneurs. Plants and horticulture help heal and boost people’s fitness and mental health. People suffering all levels of physical and mental ailments can be helped and sometimes rehabilitated through helping to grow plants and gardening. The scents, sights and textures of gardens, as well as the act of gardening itself can re-awaken memories and reignite stifled energies and abilities. Make a difference by developing new food crops and technologies which will help to feed an ever growing global population and aid their wellbeing. Help find urgently needed solutions to the environmental challenges we face. New pests and diseases are appearing all the time and we need scientists to help us fight them. While it is easy to categorise different careers within horticultural science and technology, many problems require more than one specialisation so many scientists work in multidisciplinary teams to solve specific problems. This creates a complete range of career paths from the narrow specialist to the broad general scientist or engineer. The best sportsman need the best turf to play on, and it takes the top science, muscle and machinery to keep it playing well. Green spaces are everywhere from town squares and parks to golf courses and hospitals, offering fitness, beauty, health and variety. Our parks and public gardens are the green lungs for our cities, and you could help create and manage them for thousands of people to enjoy.